Looking suitably grubby and used is this Motor Trade association membership card from 1954-1955. The member worked at the Bulls Head Garage, Holcombe Road, Greenmount, Nr Bury, which is north of Manchester. 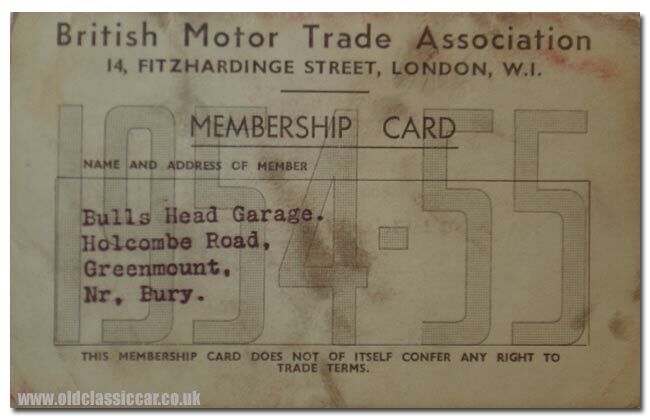 The British Motor Trade Association (BMTA) were based at 14, Fitzhardinge Street, London W1 and issued this membership card to a Mr William Smith for the 1954/1955 year. Information inside this folded card advises that it would expire after 31st March 1955. Mr Smith, of the aforementioned garage near Bury, was registered as a (Class 18) tyre dealer.